Adaptive skinning is one of the two methods by which ZSphere models can be skinned. It analyzes the structure of the ZSphere model, i.e. how child branches are formed from parent branches, and builds a (normally low-resolution) mesh based on that analysis. 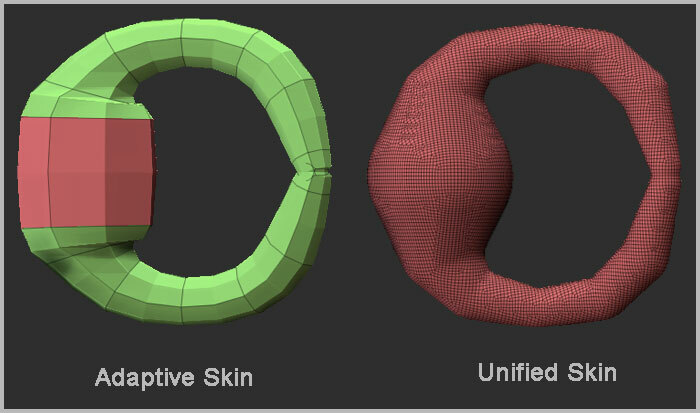 With adaptive skinning, each ZSphere is (roughly speaking) treated as a cube or rectangular solid, with the number of polygons along each edge of the cube determined by the Tool:Adaptive Skin:IRes setting. Adaptive skinning is probably the most commonly used skinning method with ZSpheres, and allows a good deal of control over the final topology, if you take the time to plan ahead. The tutorials give good examples on the use of Adaptive skinning. Adaptive Skinning is controlled by the Tool > Adaptive Skin sub-palette. Unified Skinning can also be used for zspheres. It produces a mesh simply by merging all ZSpheres and covering the resulting surface with a (usually high-resolution) mesh. Various settings control how tightly the mesh will follow the contours of the spheres, smoothing, and final mesh density. Unified skinning makes it easy to produce models of arbitrary structure for which you do not need tight control of topology, or which will serve as a prototype for later models. Unified Skinning is controlled by the Tool > Unified Skin sub-palette.